Gavin Ovsak, a Software Engineering Intern on the Hangouts API Team at Google, posted his album of his experience working at Google as an intern. 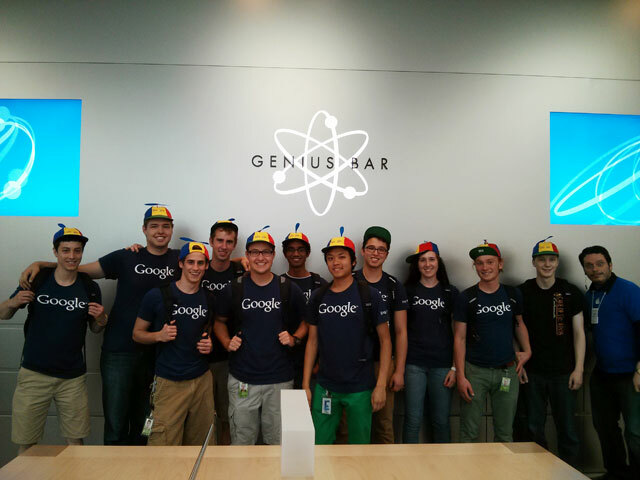 One picture was of all the interns taking a picture at Apple's Genius Bar, with their Noogler hats on. Seems like an awkward picture, being Apple and Google don't currently have the best vibe going on between them. But it is fun to see 11 Google interns standing next to one Apple genius in an Apple store. He posted the picture on Google+.